Grab new gear and make use of special buffs by bringing amiibo into Splatoon 2. Splatoon 2 offers a number of fresh and exciting twists on the classic shooter gameplay formula, and thanks to the game's Nintendo Switch heritage, players can enjoy all of the ink-splatting action at home or on-the-go. Among a host of other features to the game is amiibo support, a fairly long-standing Nintendo tradition that allows players with collectible amiibo figures to unlock exclusive in-game bonuses. For Splatoon 2 players, these bonuses include special equipment that provides passive ability buffs, and we've got the full rundown of each Splatoon amiibo as well as what they unlock within Splatoon 2 listed below. Like many Nintendo titles, Splatoon 2 offers support for amiibo from other games -- though, in this case, it appears that only amiibo from Splatoon and Splatoon 2 give in-game bonuses. With that said, players still rocking amiibo from the original Splatoon title can still look forward to some considerable bonuses. In order to unlock amiibo functionality within Splatoon 2, players need to have access to the entirety of the Inkopolis Square area. Simply completing the game's tutorial should get this requirement out of the way. After that, players need only head over to the empty amiibo box area near the backside of Inkopolis Square. Interacting with this location will bring up a dialog menu, and once there, players can place their amiibo figures over the right Joy-Con's NFC chip to unlock their exclusive bonuses. Players who were quick to grab up the new Splatoon 2 amiibo likely have access to the Splatoon 2 Inkling Girl amiibo. 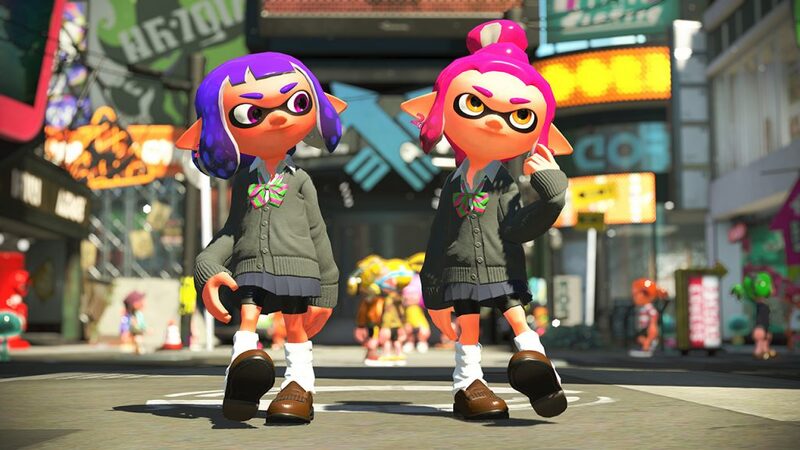 When used in-game, the Splatoon 2 Inkling Girl unlocks the School Cardigan, the Squid Clip-Ons, and the Fringed Loafers items. Each of these bestows specific buffs, including the Run Speed Upp, Opening Gambit, and Cold-Blooded enhancements. Like with the Inkling Girl, the Splatoon 2 Inkling Boy amiibo is one of the core set of figures based on Splatoon 2. Scanning the Splatoon 2 Inkling Boy amiibo in-game will provide players with the Squinja Mask, Squinja Suit, and Squinja Shoes equipment, which altogether provide the Swimming Speed Boost, Faster Respawn, and Special Saver buffs. As the last of the Splatoon 2 basic amiibo set, the Splatoon 2 Inkling Squid amiibo will allow players access to the Power Mask Mk. 1, Power Armor Mk. 1, and the Power Boots Mk. 1. These pieces of equipment will give players access to the Ink Resistance Up and Bomb Defense Up buffs. In the case of the Ink Resistance buff, both the Mask and the Armor provide this specific ability, so by using both, players will be able to considerably increase their Ink Resistance stat. Both the Callie and Marie amiibo from the original Splatoon provide access to special outfits. Unlike the other amiibo bonuses on this list, however, players will have to beat the Splatoon 2 single-player campaign in order to make use of the equipment. With that said, the Splatoon Callie amiibo provides players with the Hero Headset Replica, the Hero Replica Jacket, and the Hero Runner Replica, which provides the Faster Swimming, Faster Running, and Faster Super Jump buffs respectively. Like with the Splatoon Callie amiibo, players can only make use of the Splatoon Marie amiibo's bonuses after completing the main campaign. After that, scanning in the Callie amiibo will offer access to the Armor Helmet Replica, Armor Jacket Replica, and Armor Boots Replica, which provide the Tenacity, Ink Saver, and Special Charge Up buffs. Players who have managed to hold on to their original Splatoon amiibo figures can still expect to find cool bonuses within Splatoon 2. The original Inkling Girl amiibo grants palyers access to the School Hairclip, School Uniform, and School Shoes, which offer up the Ink Saver, High Recovery Speed, and Faster Swimming bonuses. Not to be left behind, the original Inkling Boy amiibo offers up pieces of the Samurai set, including the Samurai Jacket, Samurai Helmet, and Samurai Shoes. These pieces of equipment offer the Special Power Increase, Special Charge Up, and Quick Super Jump buffs. The last item on this list is the Inkling Squid amiibo from the original Splatoon. Scanning the Inkling Squid amiibo into Splatoon 2 will grant players access to the Power Armor, Power Boots, and Power Mask equipment. Altogether, these items grant bonuses including Higher Bomb Defense, Faster Respawn, and Ink Saver. Looking for more Splatoon 2 content? We've got a host of helpful guides and lists featured over on our Splatoon 2 guide hub. It won't be long before Switch players can get their fill of alien blood and gibs. Can the game's classically-inspired shoot-'em-up action prevail over its heavy-handed themes and dialog? Find out in our review.